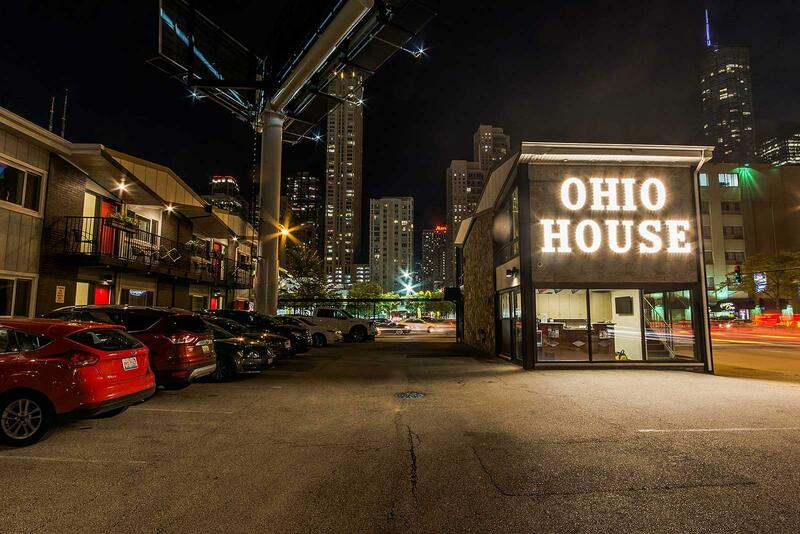 Ohio House Motel in Chicago's River North - Free Parking For Guests! Opened in 1960, the Ohio House Motel features standard, suite, and deluxe lodging. Located on the corner of LaSalle and Ohio in the river north area, our retro-Americana motel is perfect for all travelers. The Ohio House Motel is your perfect home base for your trip to Chicago. 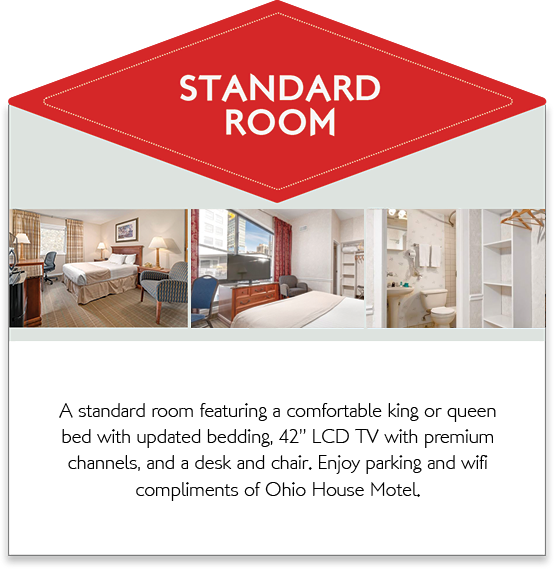 Located conveniently in River North, this hotel is just minutes from public transit, The Art Institute of Chicago, Field Museum, Millennium Park, Navy Pier, unbeatable shopping on the Magnificent Mile, award winning restaurants, nightlife and all that Chicago has to offer. Opened in 1960, the Ohio House Motel features standard, suite, and deluxe lodging. Located at the corner of LaSalle Street and Ohio Street in the heart of Downtown Chicago, the Ohio House Motel has been providing guests with comfortable, clean, and affordable accommodations for over fifty years. Having recently undergone renovations and restoration, the Ohio House Motel continues to remain a fantastic alternative to overpriced chain hotels in the Chicago area. Distinguished by its funky diamond motif, the Ohio House Motel is a piece of Americana in the heart of bustling downtown Chicago. 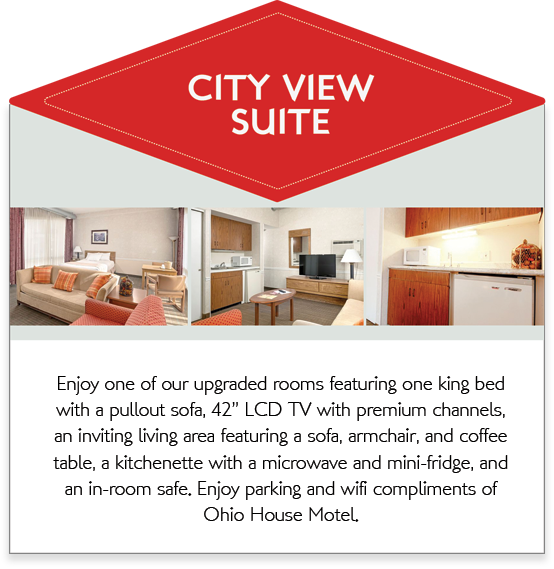 The Ohio House Motel in downtown Chicago features multiple promotions throughout the year. Through local businesses and attractions, we’re able to offer guests promotional rates including fantastic Chicago experiences. 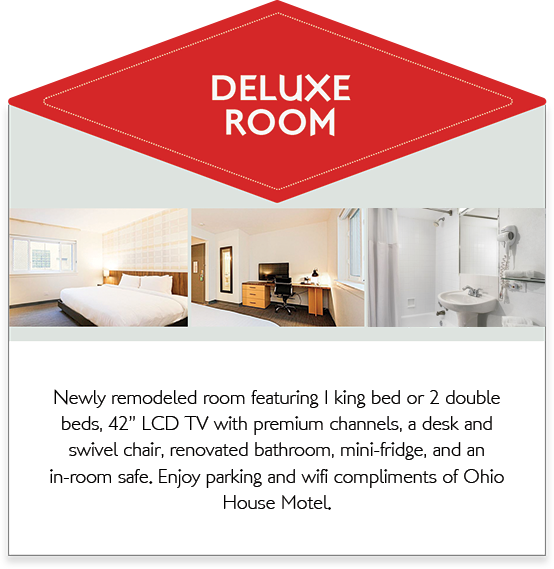 Sign-up to be notified via email about new and on-going promotions the Ohio House Motel has to offer. Sign up to receive the latest deals, promotions and special offers delivered directly to your inbox. Great location [and] the bed afforded us the best sleep of our vacation. The room and bathroom had been remodeled recently and the room was well-appointed, spacious and modern – with a large in room safe. The staff were friendly and helpful. Great value! Exactly as advertised! Clean, comfortable rooms. Walking distance to many attractions and the train if [you] need to go further away. Also free parking! The staff was very nice and hospitable. Very pleased. […] The rooms were clean and plenty of towels. And there is no extra charge for parking your car which is right in front of your room. I will stay there in the future. Perfect location for everything I needed. I was able to walk to my class and plenty of nice restaurants to choose from. Very nice staff and the rooms are simple and convenient. I will be back for business and will be staying here again.